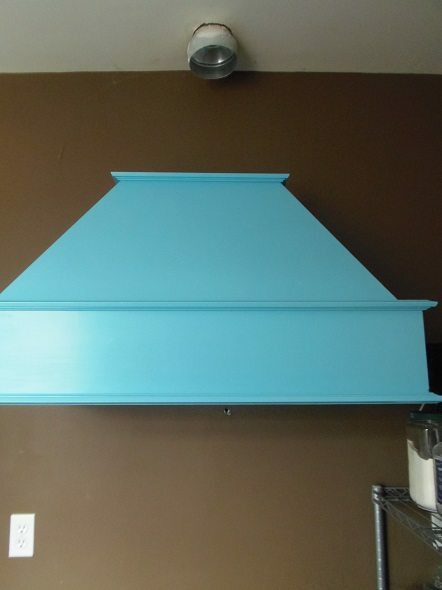 A few weeks ago my husband spotted this range hood at Habitat. It was 36-inches wide – the perfect size for our 1957 stove! 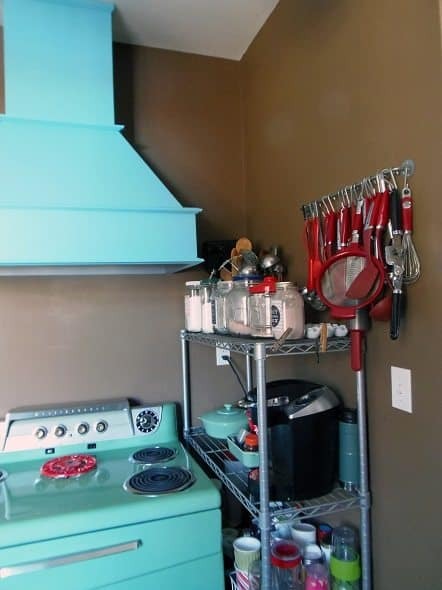 When we started renovating our kitchen a few years ago, we had wiring and a vent installed for a range hood, but we hadn’t gotten around to installing one yet. We were going to build our own, but when we came across this one for $50, we knew we couldn’t build one for any less; so we snatched it up. Dark stained wood doesn’t really fit the look of our kitchen, so we gave it a quick sanding and a new paint job. If you’ve seen my kitchen home tour, my color choice probably won’t surprise you. 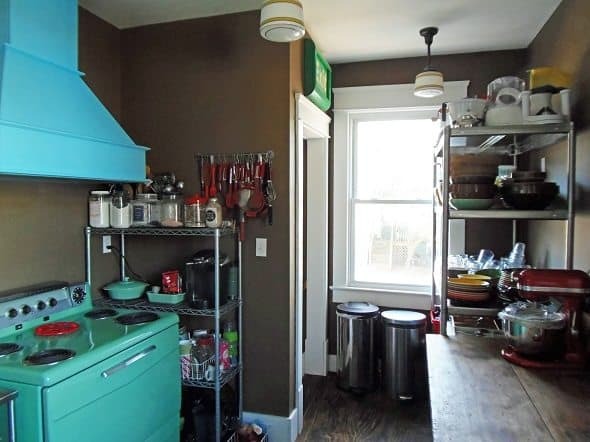 We collect Fiesta dinnerware and 50s kitchen stuff, so our kitchen is pretty colorful. This robin’s egg blue fits right in. My husband ordered a fan and insert for the hood online. The fan was around $200 (the most expensive part of the install). He was able to save some money by buying a damaged insert. It had a teeny tiny ding in a spot that was hidden by the hood, so it was $12 instead of $56. 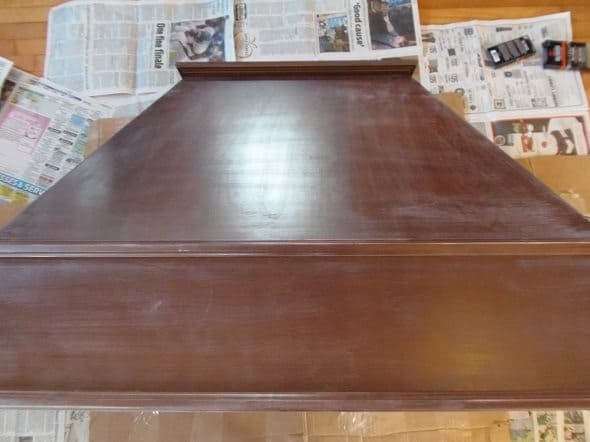 He spent less than $4 on the ductwork, another $20 for a sheet of cabinet-grade plywood to build the box around the ductwork and $4 for a piece of molding to trim it out. I also spent $25 on paint (after coupon). All told, it cost us around $315. Had we paid retail for everything, it would have cost us around $600. That’s a pretty big savings for a little second-hand shopping. 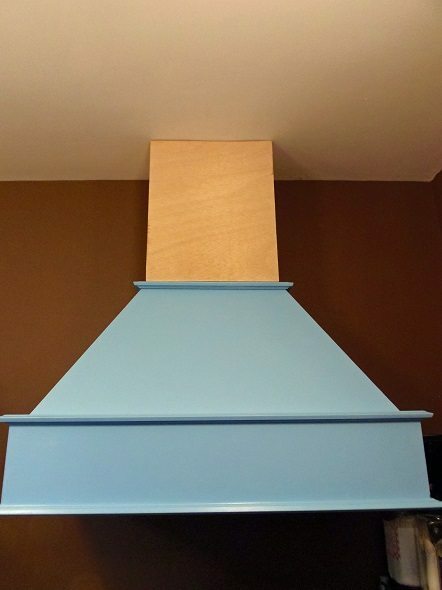 We’re super excited to have a range hood in our kitchen. We’ve never had one before. Knocking this project off of our to-do list has gotten us talking about installing the cabinets on that side of the kitchen. We still aren’t sure if we want to build them ourselves or buy them. But at least we’ve gotten the ball rolling. My fingers are crossed that I’ll have more kitchen pictures to share soon. Looks great! You guys did a fabulous job. Looking forward to seeing more…. 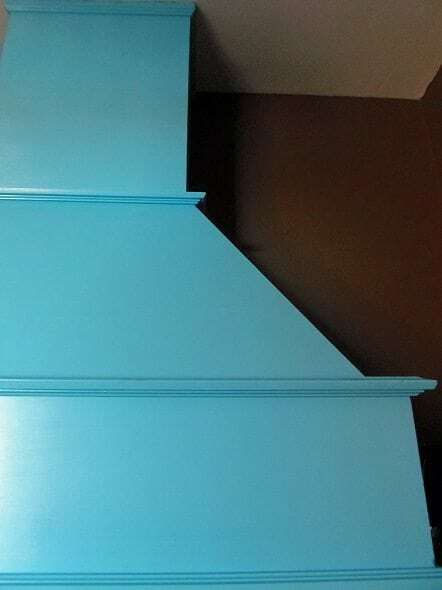 Loving that robin’s egg blue! BEAUTIFUL! 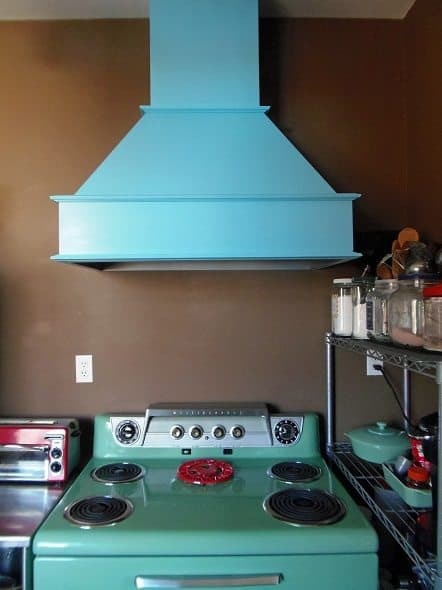 I love the color and LOVE, LOVE, LOVE that stove! !